The Swedish vocalist Tony Nova has had a musical career from the 80's with a band such Zanity, Lion's Share and has appeared on a single with Swedish Erotica in -88. In -94 he started his own band NIVA and released one album in Japan. After that album he composed new material and moved his musical direction from the metal genre into the melodic rock style. 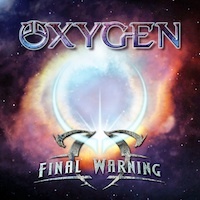 Now he's back with this new creation named Oxygen and the style is Scandinavian AOR/melodic rock. The album 'Final Warning' contains 10 wonderful gems from this great castrato singer. Tony's high-pitched voice is perfect for these melodic songs with plenty of room for him to shine. Most of the songs are classical up-tempo tracks made using the melodic ABC book. I must confess that I'm a big fan of this cheerful and tidy musical genre and appreciate this kind performances, but only in moderate doses. Here Tony and his friends go over the edge in butteries and radio friendliness. It is even too melodic for my taste. A little more attitude and backbone would have spiced 'Final Warning' up into a classic master piece. Now it stays in division below the best, but I found several shining tracks that will be in the save folder for some time. They have the talent to build something bigger and the playing time, which is just over an half-hour is too short. Best tracks: 'Anything For You', 'When Tomorrow Never Comes', 'Janitor Of Love' and 'I Wanna Know For Sure' are the top songs and I really hope to hear more from these guys in Oxygen, which besides Mr Niva count: Roger Ljunggren - Guitars, Marcus Persson - Keyboard and Bengan Andersson on the drums.